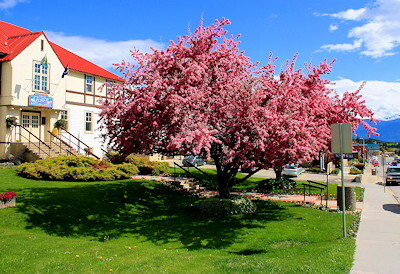 "Garden Capital of the Kootenay's"
Creston overlooks a broad, fertile valley where the Kootenay River meanders between the Selkirk and Purcell mountains and comes home to Kootenay Lake. About 12,000 ha. have been reclaimed by a series of protective dikes. This diking system and a climate that features mild winters and a warm summers with some of the country�s most fertile soil, contributes to a diverse agricultural industry. Here, agriculture plays a main role in sustaining this Valley from asparagus to cherries, peaches to squash, the Creston Valley produces it all and makes it available to all those who stop to savour the cornucopia of fruits and vegetables. Canola, wheat, barley and hay as well as corn for silage, cover the valley flats. Creston's history is based on agriculture. Grain, beef, dairy and even bison operations dot the Creston Valley flats. Visitors can experience firsthand the benefits of, not the 100 mile diet but a 10-mile diet throughout the Creston Valley. 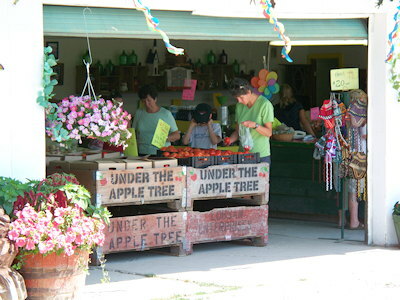 Many fruit and vegetable markets are along Highway 3 east of Creston with many u-pick operations throughout the valley. The Creston Valley Wildlife Management Area designated a RAMSAR site is home to over 270 species of birds, mammals, fish & reptiles in 17,000 acres of preserved wetlands, complete with viewing towers, boardwalk, endless walking trails and guided canoe tours. The Creston Valley is in the midst of the main migratory waterfowl migration routes. Main Industries: farming, fruit orchards, logging, mining, construction, manufacturing. Access: Reach Creston on Highway 3, east of Salmo and west of Cranbrook. Highway 3A, south of Kootenay Bay, intersects with Highway 3 at Creston town limits. 49 km from the U.S. border on Highway 21, a part of the International Selkirk Loop. Greyhound Bus Services the community along with commercial flights 110 km from Cranbrook and Castlegar International airports, 234 km (3 hrs) to Spokane International Airport. Recreation Facilities & Activities: Modern Community Complex with indoor pools, running track, hockey arena and curling rink. Nearby golf course, fishing hunting, hiking, cross-country skiing, bird-watching, farm tours including a winery & bistro, fromagerie (organic cheese factory), orchards, u-pick cherry, strawberry, raspberry & blueberry farms. Numerous artist galleries and businesses displaying local art are open for viewing. Local Attractions: Creston Valley Wildlife Management Area, Creston Golf Course, Columbia Brewery, Kootenay Candle Factory, Creston Valley Museum & Archives, Downtown Murals, Spray Park. May - Blossom Festival, Yakan Nukiy Powwow, Demolition Derby, Square Dance Festival. June - Creston Saturday Market, Creston Valley & Eastshore Art Walk/Drive. July - Goat Style Bike Festival, Creston Valley Music Fest. August - Old Fashioned Tea, Shakespeare in the Park. September - Gray Creek Sailing Regatta, Creston Valley Fall Fair, Annual Museum Quilt Show & Sale, Blue Heron Half-Marathon & 10K Run. Accommodations: The traveller can choose from motel/hotel/bed & breakfast in town and surrounding area. A number of campground/RV parks are located in and close to town.